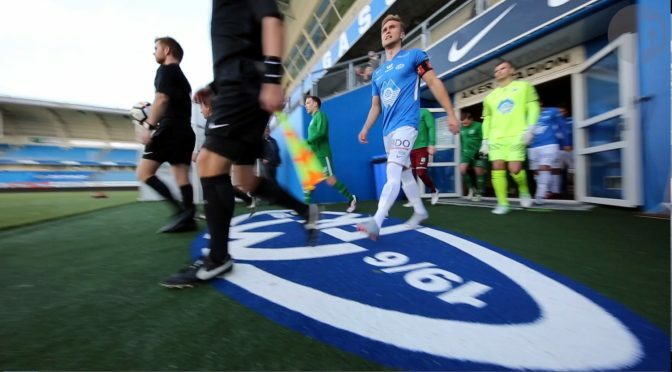 After a long year of competition between clubs of Oslo and Møre og Romsdal in the Norwegian 3rd division, Molde’s football teams, SK Træff and Molde II, faced each other during the final game of the season. At stake, much more than a simple football game with the usual three points promised to the winner, it was all about local pride and the possibility to silence the rival neighbour by finishing the season in front since Molde II only had three more points than SK Træff, and the teams goal difference’s was equal, prior to this last game. Of course, Aker stadium was the symbolic place designated to crown the second-best team in town after Molde FK, and a crowd of thousands of loud local fans made it to the stadium in time, bursting in testosterone and showing off a palpable urge for battle. Alright, this might be a slight overstatement, fans were definitely not thousands to show up. A couple of hundreds attended the game despite the chilly weather suggesting the beginning of winter, but even though none of them appeared to be by any form urging for battle, a good amount missing the first minutes, it was important to be there on October 27th to witness rivalry in it’s purest form between Molde’s own. Nonetheless, the game meant a lot for both teams, and there’s no overstatement there. Træff SK started the game in it’s aggressive signature-style, expressing from the first minute their intention of finishing on top. Molde II, on the contrary, tried to keep possession of the ball, showing off their technical ability, but also trying to regain confidence after their 0-4 loss against English-side Chelsea in the Youth League – UEFA’s under-19 European competition – which took place three days prior this game, in the same stadium. MFK’s second team is indeed mainly composed of young players that are developing in the lower national divisions in order to possibly be apart of the first team in the future. Considering the fact that more than half of the starting-eleven against Træff was part of the middle week European fixture, the need of the team to reassure itself early in the game is understandable. However, Træff had a very different idea in mind and an early disallowed goal due to an off-side position, whistled at the same time a local fan and his small dog were choosing their seat, was a premise for what was to follow. After a high-recovery of the ball, the away team’s forwards brought danger in Molde II’s defence and managed to get a penalty due to an uncontrolled tackle. Despite having left the captain armband for this game to his teammate Stian Berg Rødal, it was the club’s number 20 and daily CEO, Bjørnar Eltervåg, who took responsibility and scored the opener. 0-1 after twelve minutes in the game. The response from the hosts at Aker stadium didn’t take long to be felt and only three minutes after the first goal, it was Molde’s number 15, Anders Aarønes Iversen, who scored the equalizer with a clinical right-foot finish. As the game was keeping its high-intensity rhythm, the third goal of the game appeared quickly after the equalizer, and it was once again Bjørnar Eltervåg who – very unusually for a centre-back, but with a lot of symbolic due to his role in the club – offered himself a brace and gave the lead back to Træff SK. 1-2 after twenty minutes, which was also the final score of a very appealing first half. When the twenty-two actors came back after the break, it took them a few minutes to raise the intensity level to where they had left it, but shortly after the hour-mark into the game was passed, things escalated rapidly. It was firstly due to an arguable judgement from the referee who allowed a penalty for the home-side after an unclear foul from Eltervåg in the box. Sivert Stenseth Gussiås, Molde II’s number 9 and striker, didn’t hesitate and sanctioned the visiting side with a shot in the middle of the net. It was the trigger for a new phase of craziness on the pitch which would make room for an unforgettable finish. SK Træff ’s number 10, Harith Hamoudi Lafteh, was the first one to set the tone with a goal at the sixty-sixth minute which placed his team on top. 2-3 for SK Træff. His teammate and striker Bruno Lopes tried to take matters in his own hands after that and almost managed to find the back of the net after a longshot outside of the box, but Mathias Eriksen Ranmark cleared it beautifully with a right-handed flying save. The keeper’s save appeared to be very important as we approached the final ten minutes of the game, because at the seventy-seventh minute, on the other side of the pitch, it was SK Træff’s goalkeeper, Michael Lie, who was found guilty of a foul at the edge of the box and offered Molde II another penalty-kick. Interviewed during half-time, Michael Lie answered our questions about the importance of this game for his side and how it meant everything at this point of the season. This foul surely meant a lot for him as it gave Sivert Stenseth Gussiås a chance to put Molde II temporarily back at the second place of the league. Gussiås managed to do just that after a strong right-footed shot which didn’t offer any chance to Lie despite the keeper’s accurate choice of diving to his left. Three goals on both sides with slightly more than ten minutes to play. During this crucial time and with their back against the wall due to the situation giving them no other option than to score as soon as possible, SK Træff showed some great team values and an eagerness to achieve their season objective. At the eighty-second minute and after a beautiful collective movement, it was Ola Sjømæling who finished it perfectly and offered a decisive advantage to the «Green and White». 3-4 for the visiting side, and even 3-5 when – two minutes later, after a great fight and a perfect pass by number 28 Bruno Lopes – striker Simen Varhaugvik launched a powerful right-footed shot and assured the victory of his side. The remaining minutes of the game were as tensed as they get during a local derby with an accumulation of fouls, but the referee gave the final whistle of an impressive performance from both teams and allowed SK Træff’s players to celebrate on their rival’s ground. Interviewed during the game and at half time, several persons who attended this decisive derby helped us understand the atmosphere associated to the rivalry in Molde’s football scene. First, it was Inger Kristin Ovesen, mother of Træff SK’s number 6 Emil Ovesen Sjøvik, who shared some insights about the atmosphere leading up to the match : “This game is really important because both teams are rivals and it’s more exciting to have two teams from the same city. […] I can see that Træff plays more aggressively, they really want to win this match. Also, some players go to the same school, so it’s really important for them”. Dayane Rocha, the Brazilian international who plays for Molde Handball Club, was also in the stands to attend the match. She was there to support her husband, Bruno Lopes, and shared a similar feeling around this game : “It is very important, it’s the last game of the season”. Arrived in Molde roughly one year ago, she had time to observe the local sport scene and believes that the overall level is fairly high : “The level is good, and the competition is better than in Brazil”. A competitive level in a fairly small town that is also perceived positively by some Norwegians, as Stig Aambø, a fitness coach in Molde, explained : “It is very good. It has been a good season for both teams and even though the rivalry has always been there, it adds extra intensity, and this is interesting for the city”. As a good Molde FK fan, he gave us a sense of the rivalry from his perspective as the game was going on : “It is always nice to beat Træff, there is something extra in finishing ahead of them”. Julian Nerland Skogstad, who plays in one of Molde FK’s youth team and often follows the games of the first team, also shared his unique perspective on the rivalry between the two teams : “Molde usually dominates Træff, but Træff is getting better and better. […] The tradition is for Molde to beat Træff and it means a lot for the team”. As the last fixture of the season in the Norwegian 3rd division highlighted perfectly during an all-or-nothing game between Molde II and SK Træff, regardless of the size of the city and the number of people attending the game, a derby remains a derby!